Open year round, Lake Front Cabins has ten cabin style units in a warm friendly atmosphere. Located 500' from the water's edge, across the street from June Lake, next door to the June Lake Marina. In the June Lake Loop, you can walk to the Village's shops, restaurants and stores, Gull Lake and of course, June Lake. Two bedroom cabin styled motel suite with full kitchen. In the heart of June Lake, sleeps up to six. Rustic two bedroom accommodation facing the courtyard. Close to the shores of June Lake. 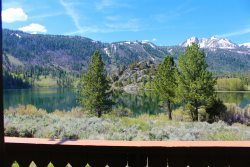 Large studio with a full kitchen close to June Lake. Walk to everything!